On the eve of World Animal Day, Knalpot presents the album Dierendag. ‘Knalpot stands for development, inventiveness, acuteness and vitality’ (Jazzenzo). Support acts by Sannety and DJ Diergarden. With dub, rock, electronic noise, ambient and jazz as its main pillars, Knalpot keeps on moving between sonic extremes. Original compositions are rebuilt from the ground up, multitasking between guitar, bass, drums, synths and big amounts of analogue electronics. 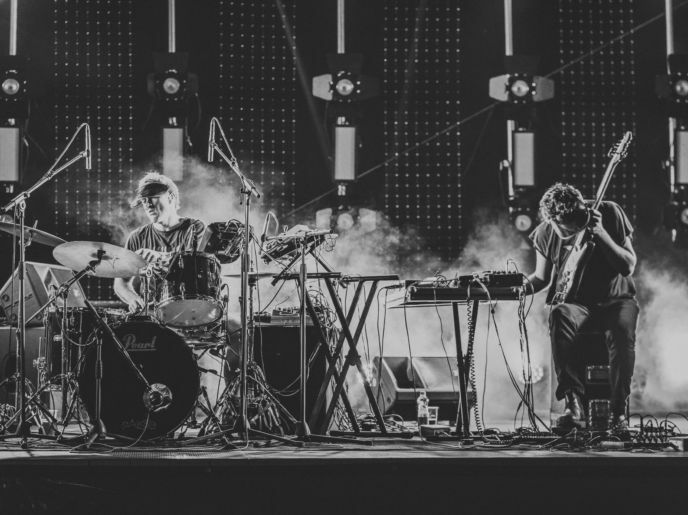 Guitarist Raphael Vanoli and drummer Gerri Jäger founded Knalpot in Amsterdam and their collaboration has been described as ‘a motorbike race between Radiohead, Clark en Squarepusher’. In the last few years soundman Sandor Caron has come to the fore as the third band member. Visual artist Meeus van Dis is the lighting designer for this presentation of the new album Dierendag. Supporting Knalpot are two illustrious musicians hidden behind mysterious names: Sannety, who will perform electronic music in the first set, focussed on the exploration of rhythms. For this purpose, she created a software instrument to venture off grids and bend time, to create a panoply of polyrhythmic patterns. DJ Diergarden will turn the tables afterwards in the café.